The core of our practice at Chattering Children has always been a family-centered, deliberate approach to develop the listening and language skills of children with hearing loss. Principles of this approach include use of state-of-the-art hearing technology, ongoing assessment, and actively coaching families to become the primary facilitators of spoken language for their child. 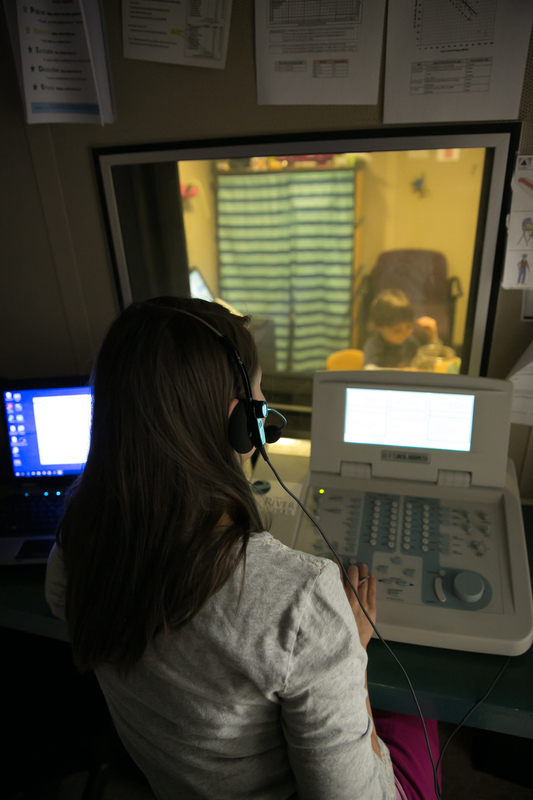 The goal of Auditory-Verbal Therapy is to maximize children’s potential in listening and spoken language and transition them into mainstream education settings. Unlike Auditory-Verbal Therapy which focuses on development of auditory skills in conjunction with spoken language development, our cochlear implant habilitation is for children and teens who are already competent users of spoken language and have a newly activated cochlear implant. The sessions focus on supporting the development of auditory skills for the newly activated ear and integrating information between ears. The River School’s Parent-Infant Program is run in conjunction with Chattering Children. It is a free resource for families of children diagnosed with hearing loss, ages birth to three. Parents, along with their infants and toddlers, meet each week for an hour. Parents learn about issues relating to hearing loss and share experiences with other families in similar situations, while the children engage in fun, language-stimulating activities. We embrace all communication options and strive to discuss topics that interest and support families. The program is facilitated by a transdisciplinary team with training in speech-language pathology, early childhood education and development, deaf education, audiology, and psychology. Dr. Adams Costa and Dr. Caverly specialize in child development and have expertise in the assessment, diagnosis, and treatment of children with hearing differences. Services include admissions testing; developmental testing, neuropsychological testing, and psycho-educational assessments. Individual therapy, family therapy, and Parent-Child Interaction Therapy (PCIT) are also provided. PCIT is a specialized intervention where a therapist observes and coaches parents and children as they play together. PCIT promotes child language and behavioral development and fosters positive parent-child relationships. Parents are taught skills they can apply in the home to promote child development, establish a nurturing and secure relationship with their child, increase their child’s pro-social behavior, and decrease negative behavior. As experts in the area of language and learning for children with hearing loss, Chattering Children provides targeted academic support complimenting students’ Individualized Education Plans. With a focus on reading comprehension, critical thinking, and oral expression, the educational team at Chattering Children offers strategic support for the student with hearing loss who is having difficulty in the classroom. Before a hearing aid is recommended for a child, the audiologist at Chattering Children will request medical clearance from a physician, preferably an otolaryngologist or otologist, to rule out any medical condition(s) that preclude the use of amplification. The medical clearance must have occurred in the last six months. Neither the child nor their parent or guardian may waive this medical clearance requirement. Once medical clearance has been obtained, the child will be seen for a Hearing Aid Evaluation. During this appointment, the audiologists at Chattering Children will discuss the child’s hearing loss and its impact on communication with the family or caretaker. Various types of hearing aids and appropriate options such as circuitry, one versus two devices, and style will be discussed. Most parents or guardians have many questions that will be addressed. One hour is devoted for the initial hearing aid evaluation. Chattering Children works with several hearing aid manufacturers (e.g., Phonak, Oticon, GN Resound, and Widex) and offers digital hearing aids in a variety of styles and sizes. Our Center also offers assistive listening devices and hearing aid accessories (devices to connect via Bluetooth to cell phones, televisions, etc.) according to patient needs and lifestyle. The cost of a hearing aid varies depending on the manufacturer and model. Once the hearing aid(s) and earmold(s) are ordered, the devices will arrive in approximately two weeks, and a fitting/orientation appointment is scheduled. At the time of fitting, the audiologist will discuss several features of the hearing aid including: insertion and removal of the device, changing the batteries, and general cleaning and maintenance. The purchase price of the hearing aid includes a two- or three-year warranty depending on the manufacturer and if an extended warranty plan is purchased. The child will have an adjustment period of 30 days with the hearing aids. This adjustment period allows for any necessary fine-tuning of the aids. If, at the end of this period, the caregiver decides to return the hearing aids for any reason, the caregiver will be refunded the amount paid, minus the cost of services. In the case of behind-the-ear devices, the earmold charge is nonrefundable, as it is custom made. Chattering Children accepts most major insurance carriers for payment of hearing aids. Some insurance plans also pay for Hearing Aid Evaluations or services related to hearing aids. It is the caregiver’s responsibility to check with the child’s insurance provider to determine coverage. The Executive Administrator at Chattering Children will work with parents to determine reimbursement for hearing aids and services.